Vice President Mike Pence thanked employees at NASA’s Kennedy Space Center in Florida for their commitment to America’s continued leadership in the space frontier during a visit to America’s multi-user spaceport on Thursday. Acting NASA Administrator Robert Lightfoot thanked Vice President Pence and the administration for their strong support, and pointed out the evidence of government and industry cooperation on display at Kennedy. Vice President Pence also got a first-hand look at the public-private partnerships at Kennedy during a tour that showcased both NASA and commercial work that will soon lead to U.S.-based astronaut launches and eventual missions into deep space. The Vice President started his visit with a concrete example of public-private development, as Air Force Two touched down on the Shuttle Landing Facility, the former space shuttle landing strip now leased and operated by Space Florida. After his remarks in the Vehicle Assembly Building, the Vice President shook hands with employees before departing on a tour, accompanied by Lightfoot, Kennedy Space Center Director Robert Cabana, and NASA astronauts Pat Forrester and Reid Wiseman. 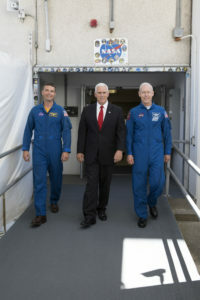 The Vice President visited the center’s Neil Armstrong Operations and Checkout Building, where the Orion spacecraft is being prepped for its first integrated flight with SLS in 2019. Orion has elements made in America by workers at more than 1,500 companies in 48 states, and some of that work, including components of Orion’s protective heat shield, were on display during the tour. A driving tour showcased the mobile launch platform being readied for SLS flights as well as two commercial space facilities: Launch Complex 39A, the historic Apollo and shuttle pad now leased by SpaceX and used for commercial launches, and Boeing’s facility, where engineers are prepping the company’s Starliner capsule for crew flights to the space station in the same facility once used to do the same thing for space shuttles. 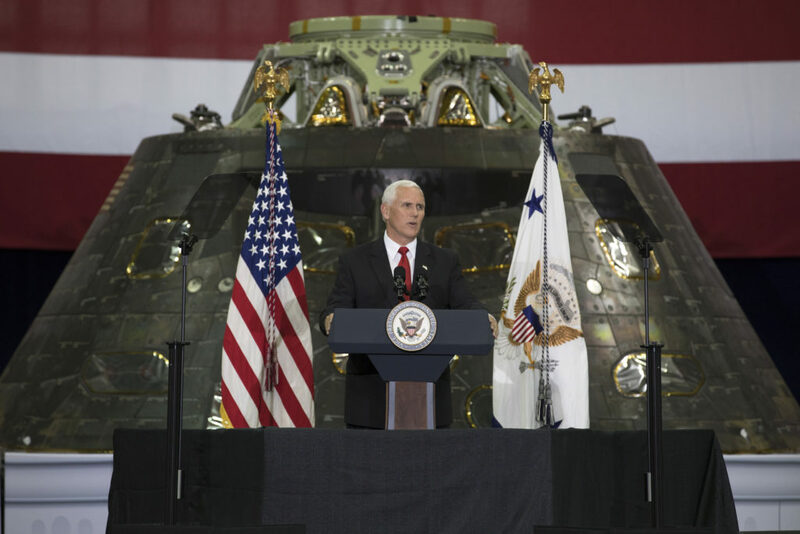 The Vice President also discussed President Trump’s executive order signed on June 30, re-establishing the National Space Council to coordinate all aspects of the nation’s space power. The Vice President said the Council will bring a renewed sense of purpose to America’s space policy by strengthening our economy and unlocking new opportunities, inspiring our children, enhancing our common defense and advancing the security of the American people.